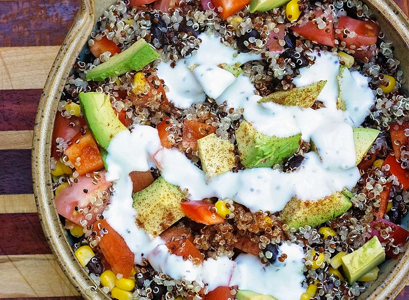 A delicious recipe for Quinoa Taco Salad from Tamara Camera Blog. 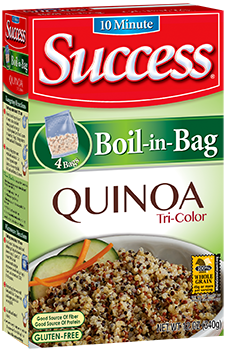 Prepare the Success® Tri-Color 100% Quinoa according to instructions on box. In a small box, mix lime juice with chili powder, cayenne powder, cumin, paprika and salt, and set aside. In a larger bowl, combine the quinoa, avocado, tomatoes, black beans, corn, and peppers. 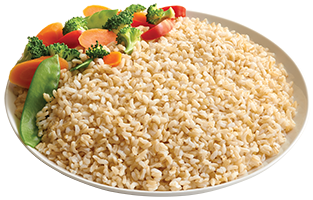 Stir in the spice/lime juice mix and toss it evenly throughout the quinoa. You may need a pinch more salt/lime juice. Top with either hot sauce or a sour cream based dressing.